Following the staggering success of the iOS App Store, Apple opened the doors to its Mac App Store in January 2011. In just 24 hours, it had already amassed over 1 million downloads, and it has continued to grow in popularity ever since. Apple has been working to improve the experience for both users and developers, and over the past year, it has focused its efforts on speeding up the review process. But for many, its restrictions still prove problematic — as does its 30 percent cut of every penny made. To find out whether the pros outweigh the cons, what’s changed over the past 12 months, and whether business really is more convenient on the Mac App Store, Setapp surveyed 742 macOS developers. For the vast majority, the App Store isn’t their sole distribution channel. 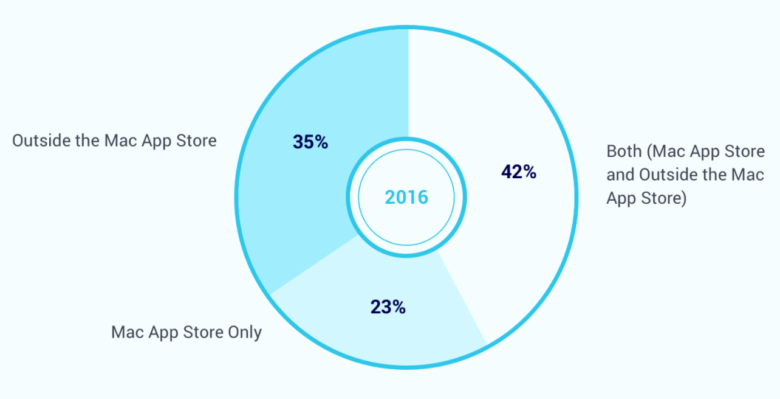 Only 23 percent of developers sell their software solely through Apple, whereas 47 percent — up from 42 percent in 2016 — also offer their content outside of the App Store. Just 23 percent make the Mac App Store their sole distribution platform. And thanks to Apple’s revenue cut, developers earn more on the outside. Just 44 percent of revenue is generated through the App Store — down from 48 percent in 2016 — while revenue generated on the outside is up from 52 percent to 56 percent. A measly 18 percent of developers who distribute their software solely through the App Store would promote the service to a friend or colleague, Setapp found. Of those who also distribute outside the App Store, just 12 percent said they would recommend it. It’s no surprise, then, that only 31 percent of developers — down from 38 percent in 2016 — say selling through the App Store is worth Apple’s 30 percent cut. So, what’s the problem? Well, sandboxing, Apple’s way of ensuring that App Store apps only have access to the system resources and user data they really need — and nothing else — is by far the biggest complaint. It’s designed to make us safer, but it’s a big issue for developers. A whopping 71 percent of respondents said sandboxing has become a deal-breaker for their business, compared to just 17 percent last year. 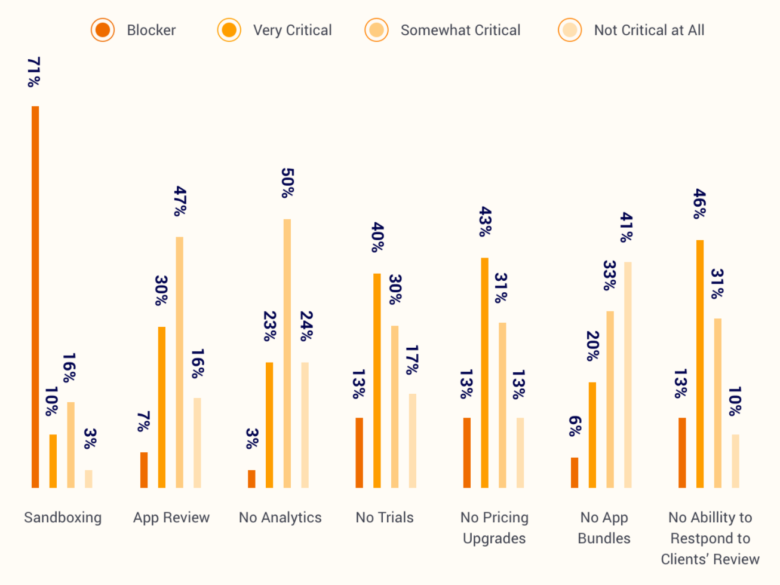 Meanwhile, the app review process and the lack of analytics became less critical. Sandboxing is an even bigger issue in 2017. What can Apple to do improve? When asked what Apple could do to improve the App Store review process, 19 percent said they would like to see more flexible sandbox rules, while 18 percent want communication with the app approval team. 14 percent asked for clearer reasons when apps are rejected. Another recent improvement to the App Store was the introduction of software subscriptions. 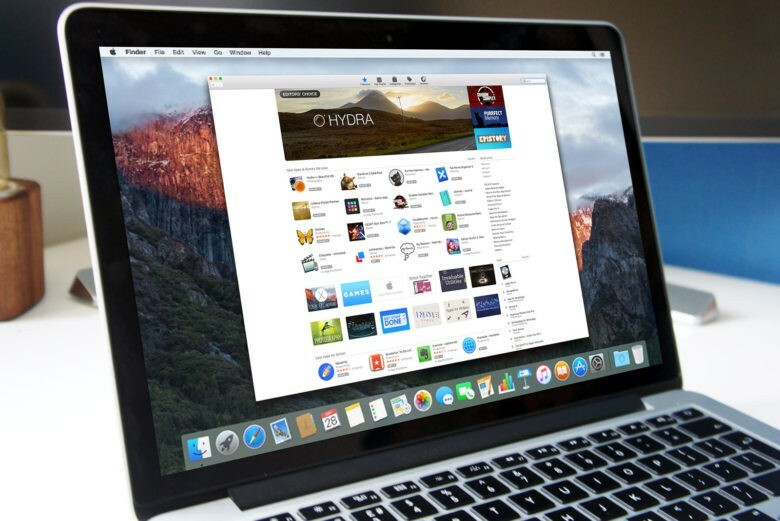 Some 20 percent of macOS developers have now switched to a subscription model, Setapp found, while 48 percent said that subscriptions have had a positive impact on business. Subscription pros include increased revenue, a better relationship with customers, an improved product, and a faster-growing user base. Of those who have tried subscriptions, 80 percent said they would recommend this model, while just 3 percent gave an outright “no.” Of those who are yet to try it, 50 percent said they will in the future, while 19 percent have no plans to do so. Thanks to the App Store’s cons, a whopping 76 percent of macOS developers are still yet to try distributing their software through Apple’s marketplace. 66 percent said the reason for that is the lengthy and “unclear” review process, while 59 percent blamed Apple’s cut. When it comes to third-party distribution platforms, DevMate was rated the best by 28 percent of respondents, while Paddle and FastSpring grabbed second and third place with 21 percent and 20 percent respectively. It’s clear the Mac App Store is improving in many ways, particularly when it comes to the app review process. But it remains a frustrating platform for developers, mostly thanks to Apple’s strict software guidelines and hefty revenue sharing policy.